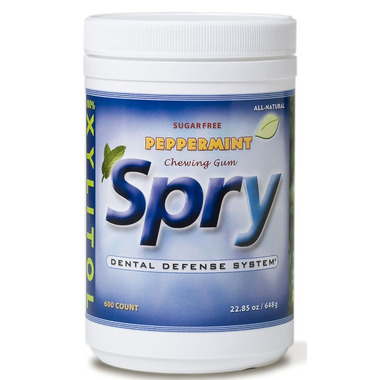 Spry Xylitol Chewing Gum peps up your mouth with icy freshness and may reduce the risk of tooth decay. Ingredients: Xylitol, Gum Base, Natural Flavor (peppermint oil), Vegetable Glycerin (humectant), Gum Arabic (texturizer), non-GMO Soy Lecithin (emulsifier), Calcium Carbonate & Beeswax (glazing agent). Ever since reading Dr. Ellie Phillips' book ''Kiss Your Dentist Good-bye'' I have been trying to make sure that all the members of my family consume at least 6-10 grams of xylitol per day so that they can be cavity-free. Each of these Spry pieces of gum have 1 gram of xylitol. I keep a jar of gum in the front hall of our home so that anyone can grab a piece whenever the thought arises. It is not easy to find 100% xylitol gum, so I was so happy when I found a large quantity here on Well.ca. This Spry brand of gum is really delicious! We really love it! I will definitely buy them again from here!